President Trump’s nominee for the Supreme Court may prove a crucial conservative vote in cases defining protections for gay and lesbian workers, the scope of union organizing and the rights of workers to take their grievances to court, according to labor law experts. On Monday night, Trump announced the selection of Brett M. Kavanaugh, a federal judge on the U.S. Court of Appeals for the District of Columbia Circuit. Justice Anthony M. Kennedy, who said late last month that he would step down from the bench, sided with the conservatives in both cases. But experts said the court’s opposition to organized labor’s priorities are likely to intensify if Kavanaugh is confirmed, as business groups will accelerate their efforts to erode the clout of unions under a conservative court. On the right, conservative policy experts expressed optimism that Trump’s nominee would continue pushing the court in the direction Chief Justice John G. Roberts Jr. has steered it in recent years. An overview of Kavanaugh’s written opinions on labor law by Littler Mendelson P.C., a law firm that represents employers in labor disputes, found that the nominee’s writings “do not reveal any particular leanings that might concern the employer community.” Richard Trumka, president of the AFL-CIO, said Kavanaugh “routinely rules against working families” and denies “employees relief from discrimination in the workplace." Here are three areas where Trump’s Supreme Court pick could dramatically change U.S. labor law. 1. The scope of the union. Workers can form a union with a simple majority vote. Under current labor law, the union represents all the workers in the relevant group – whether they voted for the union to be formed or not. But the Supreme Court’s ruling in Janus v. AFSCME said government workers cannot be forced to pay fees to a union, calling it a violation of their free speech rights. Now, labor groups fear that the court will take one step further and say public sector workers also cannot be represented by a union they did not seek to join. 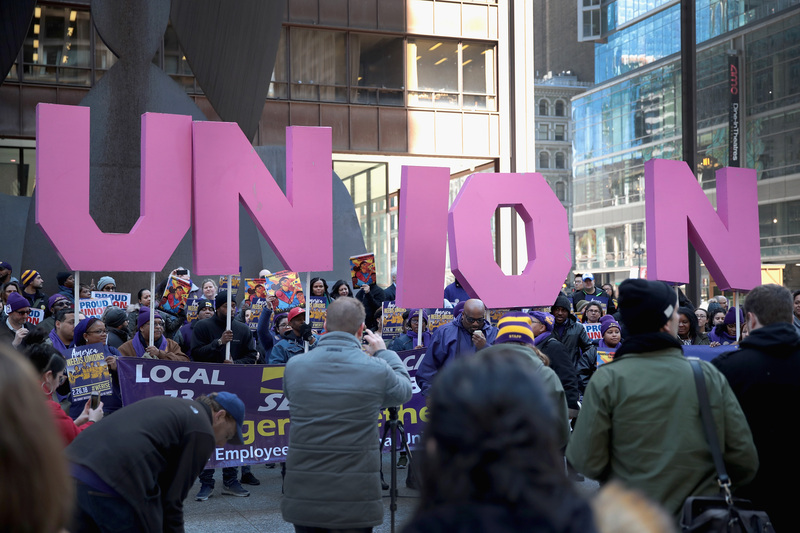 The court could rule that membership requires some sort of declaration from an employee that she wants to be a part of the union, which could reduce the number of workers the union represents. 2. Employment discrimination against gay people. Kavanaugh may also have to decide whether businesses can discriminate in hiring based on sexual orientation. The courts had long held that a company can reject a job application because someone is gay, bisexual, or transgender. But, more recently, some lower courts — including the U.S. Court of Appeals for the 2nd Circuit — have found that LGBTQ people are protected from hiring discrimination. “It’s a momentous question,” said Brishen Rogers, a labor law professor at Temple Law School and visiting scholar at the Roosevelt Institute, a left-leaning think-tank. In employment discrimination cases, Kavanaugh’s decisions “over the years typically favored the employer,” the review by Littler Mendelson found. The review did not specifically cite a case about discrimination based on sexual orientation. 3. Taking employers to courts instead of arbitration. Organized labor is also worried that a court that includes Trump’s nominee would allow more employers to force their workers to take their complaints through arbitration, a private adjudication, rather than through the public courts. In its most recent session, the Supreme Court ruled in Epic Systems Corp. v. Lewis that companies can require workers to settle employment disputes through individual arbitration, finding that employees should not always have the ability to bring collective action claims through the courts. The decision, written by Justice Neil M. Gorsuch, a Trump appointee, could affect more than 25 million workers. Kavanaugh ruled last year against employees' right to bring a lawsuit under the Occupational Safety and Health Act’s retaliation provision, the Littler Mendelson review said.